What is Tantra and Tantra Yoga? Traditional Tantra Yoga (also called Kaula) is a meditative form of yoga that teaches your whole body to meditate. This form of yoga is about relaxation. Contrary to many other forms of yoga, where the focus is on which muscles are being used and where the stretch is, Traditional Tantra Yoga is about the parts of you that relax, and you will be guided into a deep relaxing and meditative state through yoga postures and breathing. You will learn to follow your intuitive body awareness and not focus on perfect external standards – neither in yoga nor in everyday life. When you learn to relax like this, you will let go of having to perform all the time, and you can start to express from your true self. It is a practice that will optimize and balance your subtle energy system (prana or chi) and it does not only focus on the physical aspect. Therefore, this traditional practice will optimize and balance your system in every way, and will bring you to your full potential both physically, mentally, emotionally and energetically. 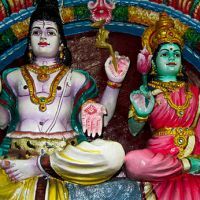 Traditionally, Tantra and Tantra Yoga is far more than just the physical and sexual aspects that are often the main focus when you hear about tantra today. Tantra is not a variety of techniques to achieve sensual pleasure, but a way of living and understanding life that can give you a life of complete freedom and harmony. Not freedom from taking personal responsibility and from relating to the world, but freedom from all culturing that can keep you from living your life to its full potential. Tantra teaches you through a combination of practice and knowledge to be your true self. In Tantra, there are many different tools to educate yourself and to help you live out your full potential. The physical practices are important and include asanas (yoga postures), pranayama (regulation of your breathing) and bandhas (locks) and more. These are based on traditional ayurvedic knowledge about prana (your subtle energy system), which is your vital life force. By balancing your prana through the physical practice, you will optimize all parts of your system, and this will bring you to your full potential both physically, mentally, emotionally and energetically. Besides the physical practice, knowledge is also an important part of Traditional Tantra. Not just intellectual knowledge, but a deeply integrated knowledge and understanding. Knowledge from the traditional texts and masters can help you to understand yourself and the universe, and can help you to integrate the knowledge you get. There are many texts that, when you understand how to interpret them, gives you insight into life (e.g. Dhyana/meditation, Karma, Dharma, Kundalini, Chakras, Prana, Samadhi m.m.). With this knowledge, you will stop constantly looking for approval from the outside and you will stop constantly comparing yourself with others, as you will understand and accept yourself and the world you live in. This will help you to live your life to the fullest and thereby experience true freedom and harmony.